After a brief lull since late February, US-China in-person negotiations resumed last week with a “lightning round” of negotiations in Beijing and a parallel round of talks in Washington this week, both focused heavily on bilateral text for potential bilateral agreement. NAM sources indicate that these discussions, run by the senior representatives from each country (US Trade Representative Robert Lighthizer, US Treasury Secretary Steven Mnuchin and Chinese Vice Premier Liu He), are working through the full mix of issues previously identified by the United States as priorities, including purchases of US goods and services; structural issues such as forced technology transfer, intellectual property rights, cyber theft, agriculture, services, non-tariff barriers, and currency; and specific enforcement mechanisms to ensure that both sides meet commitments in the agreement. 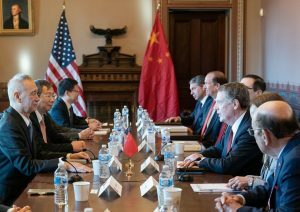 Liu arrived in Washington earlier this week for a follow-up round of talks that began earlier today. Both US and Chinese statements following March 28-29 talks in Beijing pointed to progress, with a White House statement citing progress “during candid and constructive discussions on the negotiations and important next steps” and a similar Chinese statement saying that the two sides had “discussed the related text of an agreement and achieved new progress.” Yet the wide range of challenging issues under discussion, including key sticking points such as enforcement and technology transfer, and the detailed nature of the text review both raise questions about how quickly an agreement can be made, a message that administration officials have carried in signaling that it could still take “weeks or months” to get the right deal.